1) You will need to decide on a sanitizer. You can choose either bromine or chlorine. Never mix the two together. It is a good idea to invest in a chemical dispenser that will slowly release the sanitizer over time. 2) You can add an ozone generator, UV generator, enzymes, Frog or other mineral sticks to reduce chemical usage. You will never be able to completely eliminate the use of a sanitizer, but these more natural water purification methods will help you cut down on the amount of chemicals you need. 3) Buy water test strips or a test kit. You should test the water 3 times a week – for instance, Monday, Wednesday and Friday. Checking water levels regularly will usually mean only minor adjustments are required. Chlorine should stay between 2.0 -3.0 ppm. Bromine should remain between 3.0-5.0 ppm. 4) Keep water pH between 7.2 -7.6. It the pH level is too low, you will need to add pH Up. If the pH level is too high, you will need to add pH down. Have water that is too acidic or alkaline will affect the equipment in your spa, causing it to deteriorate more quickly. If the pH is too high, you will get cloudy water and scaling. If the pH gets too low, you could see corrosion in the spa equipment. 5) To reinvigorate suspended bromine or chlorine, shock the water. Adding a shock treatment helps eliminate contaminants like body oils, perspiration, cosmetics, etc. It also helps eliminate the chloramines or bromines that can cause odor and skin irritation. 6) Add other chemicals as needed to solve specific problems. For instance, there are products like foam down, water hardness adjustment, scum away, spa bright and clear, etc. 7) Perform regular filter maintenance. Your filter is the key to your water maintenance program. Remove the filter and clean with a hose once a week. It is a good idea to remove it once a month to soak overnight in a filter cleaner. You cannot run the spa without a filter, so buy a spare to pop in while you clean the dirty one. Filters need to be replaced when they become dark grey/black, or frayed, since it will no longer effectively trap small contaminants. Generally, expect to replace your filter each year. 8) When in doubt, empty it out. 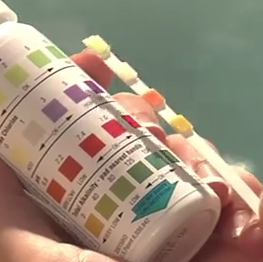 If your water has been in the spa for more than 3 months, or if you can’t get it within the safe levels on your test strips, then drain the hot tub. Make sure to thoroughly clean the spa, also hosing the jets and filter. You can buy specially formulated spa chemicals, like filter spray, filter soak or multi surface care, to clean your spa properly. Avoid household chemicals that could foam or clog plumbing lines. One last word of caution – buy quality hot tub chemicals online to get the best prices and results. Products like Leisure Time or Spa Breeze are made in the USA and are specially formulated for spa water. Learn more about hot tub chemicals with this video: https://www.youtube.com/watch?v=FBZvPM9ZVoY.